Ylren is a skinny, yet athletic elf. He has medium length brown hair and tan skin. He often wears furs in town, but dresses in proper hunting attire when required. Note- Sniper adds + 2 strike to bow attacks, but takes 2 attacks. Called shot, 25% distance, modified 20 deals triple damage. Sharpening Stone 1 Small Sack Makes arrows pointy- Ouch! Ylren grew up on Phi with his parents. He remembers his father’s epic stories of going on hunts on the great mountain. Tales of slaying might Wyverns and Peryton filled the nights with glorious wonder and adventure. 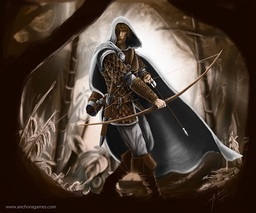 Ylren played with his fathers bow feeling each crevice and marking with his fingers. From an early age Ylren knew that he would have to best his father’s stories. His mother however, was scrutinizingly particular of which trophies were allowed into the house and which were forced to be sold into the hands of a novice hunter used to impress a young lass into loosening her corset. It was more than that though. His mother knew the dangers of the hunt. A beast has no mercy or kindness. It will use every last ounce of energy it has to survive. The home was empty for such a long time. Ylren’s father would go on long hunts leaving the child and wife to survive off of his earnings of pelts and trophies. It was a good life, simple but good. The only thing missing was Ylren’s father. It didn’t matter though. Letters and drawings filled most of Ylren’s young imagination as he journeyed with his father through them. He became a self-taught marksman and practiced till he was old enough to go on trips with the wealthy thrill seekers that visited Phi. Ylren served as the protector, guide, and mercy killer of the group. Many a noble would go in aiming for improper areas of animals. This left them maimed and suffering. It was Ylren’s job to discreetly finish of the mark. The rich blood’s never carried their prizes back either. Ylren began to make a name for himself. If someone wanted the best guide and marksman on the island for hire, it was him they sought. It was starting to spread. Even so that his father who would be returning soon, was planning on taking his son on a trip for the first time. Ylren’s father who acts as a guide through the coral on each return was planning his return to pick up Ylren. It was a great honor for Ylren’s father to act as a guardian through the reefs. The Magi have strict rules on character. Once a person is a guide, they must check in with the Magi every five years for reassessment. The title of guide is revered as it has assisted the isle of Phi in preventing many invasion attempts. Especially the one Ylren’s father experienced as he was returning home to pick up his son. While Ylren’s father was sleeping on board the ship headed to Phi, dwarven pirates in guise as passengers took control of the ship and tossed all unnecessary people overboard. They kept a few for leverage however. When Ylren’s father woke, he was rushed onto deck by the dwarves. They held him there at sword’s edge. At first he would not give in. The pirates then proved their resolve by living up to their threats. A body was tossed overboard and the tears of the young maiden next in line seemed to freeze time. Biting his lips Ylren’s father stuttered at first. The words barely came out, “I’ll…………I’ll take you. Let them live and I’ll take you.” With that the dwarves smiled. Ylren’s father knew that if the pirates made it to land, there would be no hope for the small fishing towns they were headed to and it was too close to his wife and son. Yet Ylren began to navigate the maze of coral. He then heard a whisper that was barely audible, yet time was moving so slow and Ylren’s father so focused that he could hear it as loud as a shout. “Kill them all as soon as we are through,” whispered the dwarf. With that Ylren’s father made a wrong turn. A turn that would change Ylren’s fate forever. Within moments blood filled the water as the sharks feasted. Phi was safe once again. Ylren waited for days. There was no word of his father. Then one day he heard a knock at the door. A massive brute of a man introduced himself and invited himself into the house. Soon there was another knock at the door. This was a younger human woman. She was quite gruff and invited herself in as well. Pretty soon more and more people began pouring in. Ylren’s mother greeted each one and waited on them. They seemed to be quite cheerful. Many began drinking and the humble home became a pub that night. Each person took turns talking to Ylren about his father and how great of an elf and hunter he was. They said that Ylren had been highly spoken of. There were stories they had heard of about his great accomplishments. Ylren thought of how insignificant he was compared to his father’s skill. Yet each person seemed to welcome him as an old friend. Then one person came forward and stated that Ylren’s father had sponsored him and paid for his entry into The Great Hunt. This was a fabled hunt that expanded across all of Palladium. The hunt lasted ten years. The first person to either complete or have the most marked off a list would be declared the winner and would receive the prize. Ylren would have to leave the next day to prepare. He had yet a few months before the event would begin. The night began to wind down and Ylren’s mother knew there was no stopping her son. Yrlen had been inducted into The Hunter’s Guild. It was his destiny for greatness. As he headed out, Ylren’s mother gave him a kiss and prayed a prayer of Bennu over him. Ylren left and has been wandering the world for a short while preparing for his chance to win The Big Hunt.